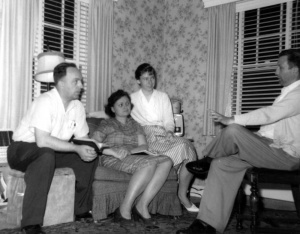 Another family from Rockhill, Stuart and Myrtle Heebner, joined the group within a year or two. Shortly thereafter a number of young married and single folks began serving in I[[I-W Service (United States)|-W alternative service]] at a nearby veteran’s hospital. Some of them attended and became involved at Centereach Mennonite, mostly just for the length of their two-year service. For some time, worship services were held in the Godshall home, but once there were a good number of local people attending, Franconia Conference helped with voluntary labor to build a small meetinghouse on property Curtis Godshall had bought with his house. 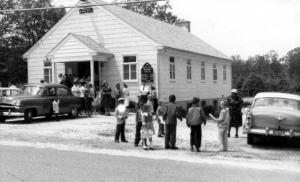 An important part of the church during these early years was a two week [[Summer Bible School|Summer Bible School]] program attended by an average of 150 children. Teachers would come from eastern Pennsylvania and other areas to help with the program. Harleysville, Pennsylvania'']] For some time, worship services were held in the Godshall home, but once there were a good number of local people attending, Franconia Conference helped with voluntary labor to build a small meetinghouse on property Curtis Godshall had bought with his house. An important part of the church during these early years was a two week [[Summer Bible School|Summer Bible School]] program attended by an average of 150 children. Teachers would come from eastern Pennsylvania and other areas to help with the program. Landis, Glenda Godshall. "Centereach Mennonite Church (Centereach, New York, USA)." Global Anabaptist Mennonite Encyclopedia Online. January 2013. Web. 22 Apr 2019. http://gameo.org/index.php?title=Centereach_Mennonite_Church_(Centereach,_New_York,_USA)&oldid=116014. Landis, Glenda Godshall. (January 2013). Centereach Mennonite Church (Centereach, New York, USA). Global Anabaptist Mennonite Encyclopedia Online. Retrieved 22 April 2019, from http://gameo.org/index.php?title=Centereach_Mennonite_Church_(Centereach,_New_York,_USA)&oldid=116014.